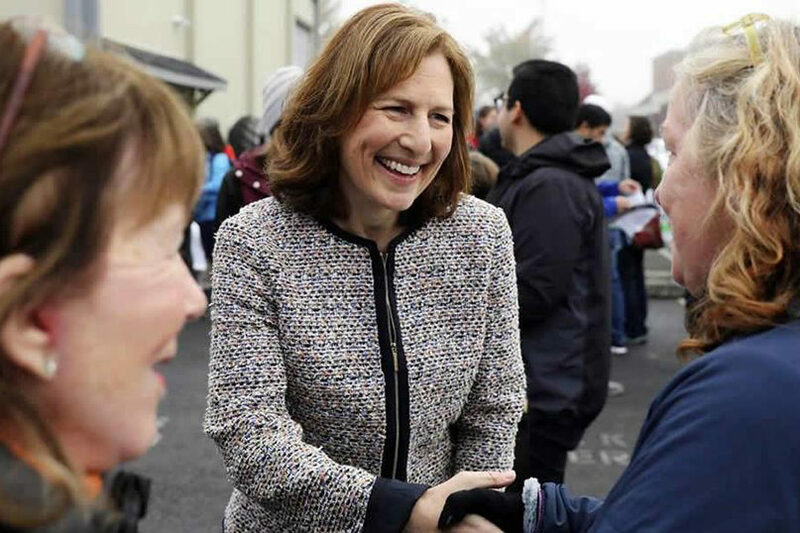 (JNS) Democratic Rep. Kim Schrier defeated Republican Dino Rossi in Washington state’s 8th Congressional District in the 2018 midterm elections to replace retiring Republican Rep. Dave Reichert. JNS talked with Schrier in person. The interview has been edited for brevity and clarity. Q: What’s your overall stance on the U.S.-Israel relationship? A: I am a Jewish woman and representative from Washington state, so I grew up with unquestionable love for the State of Israel and an understanding that Israel is the only democracy in the Middle East. Our values are shared. It is absolutely fundamental that the Jewish people have a state of their own where they are safe. Q: You’re one of the freshmen Jewish members of the 116th Congress. Mind giving our readers a quick overview of what it was like growing up? A: I had a pretty normal childhood. I grew up in a middle-class family with a mom who was a teacher, a dad an aerospace engineer. We attended a Reform synagogue close to our house. I had a typical Jewish upbringing: Sunday school, Hebrew school, bat mitzvah. I raised my son as well in our local synagogue. I think with that comes an understanding that it is really important to have a Jewish state, and that given the history of civilization, the Jewish people need a homeland to call their own where they are safe. The relationship between the United States and Israel is paramount: The safety and security of Israel depends on the U.S., and the safety and security of the U.S. depends, in many ways, on Israel. Q: Are you going this summer? A: That is my plan. Both times, I went was during medical school. One of them was over a summer break, and I did a work-study hike program called Livnot U’Lehibanot, which got to immerse me in a Modern Orthodox lifestyle, so I really got to experience what it was like to observe all of the traditions. The second was a program where I studied dermatology at the Chaim Sheba Medical Center at Tel HaShomer Hospital near Tel Aviv. Q: You mentioned going on a program where you followed Modern Orthodox traditions. What was that like coming from a Reform background? A: I’m a person who likes to learn, and I have an open mind. For me, it was a really interesting way to go, and hear a perspective and experience a cultural immersion that was different. With every experience in our lives, we bring something back. The importance of having a break and a rest and the importance of traditions stuck with me. I continue to be a Reform Jew. Q: What is your reaction to the president announcing that U.S. troops will withdraw from Syria? A: That has been walked back a bit. We need to be very thoughtful about our foreign policy and not leaving power vacuums in the Middle East. It was a hasty decision and, hopefully, if that is the plan, it will be done thoughtfully and gradually to make sure there is no power vacuum and to protect the Kurds [our allies]. A: I am very hesitant to give a presidential authorization for the use of military force. That should come to Congress; that’s our job. We do need to combat Iranian and Hezbollah might for a multitude of reasons, one of which is they’re a neighbor of Israel. We need to keep Israel safe and secure. Q: What’s your reaction to some of the anti-Israel verbiage coming from fellow Democratic Reps. Ilhan Omar and Rashida Tlaib? A: I have mixed feelings. It is completely legitimate to call into question or disagree with the leadership of a country. I very much love my own country, the United States, but I can disagree with its leadership in the same way I can love and feel passionately about the State of Israel, but disagree with its leadership. I do believe some of the language crossed the line from being questioning of [Israeli Prime Minister Benjamin] Netanyahu’s administration to suggesting that there is question about Israel’s right to exist, and an anti-Semitic bent that needs to be addressed. Q: Do you agree with the calls for Rep. Omar to be removed from the House Foreign Affairs Committee? A: I believe that this is a place where you win over hearts and minds much more with a carrot than a stick. I consider it my responsibility as a Jewish woman in Congress in this freshman class to befriend my colleagues and show them a different perspective. We all grew up in our own environments. If you grow up in an environment where Israel is cast as demonic, it can be hard to see another viewpoint. I look forward to learning about each other’s histories and different perspectives. Q: Have you reached out to Congresswoman Omar? A: We continue to see each other frequently, and I think that this relationship will build over several years. Q: What was your reaction to the president saying that the Democratic Party has become an “anti-Jewish” and “anti-Israel” party? A: It’s total rhetoric and baloney. We’re absolutely supportive of the State of Israel, and I think he is setting that up for political reasons, and it is completely unfair and unfounded. We unequivocally support that State of Israel and its right to exist. Q: What’s your stance on the 2015 Iran nuclear deal? A: It was a mistake to withdraw from the Iran deal, however flawed it may have been in the beginning. It was working, and it was an agreement. We pulled out of that agreement at exactly the same time that our president was entering into supposed negotiations with North Korea. It sends a very big message when the United States pulls out of an agreement—that we cannot be trusted. Q: What do you say to those who criticized the agreement and said it gave $150 billion to the world’s leading state sponsor of terrorism? A: I stand by my word. It was working. The end of the term we were talking about, it could have been renegotiated, and we were working with partners all over the world to do this. Partnerships are far more effective than isolationist strategies. A: I think it’s generally understood that Jerusalem is the heart of Israel. I also think that it is widely understood why the embassy was not relocated to Jerusalem. The reason is that it is provocative, and that negotiations over Jerusalem and the embassy were meant to be the final resolution in a two-state solution and the end part of peace negotiations. To jump the gun was to show that the United States was not a neutral broker in Israeli-Palestinian peace negotiations. I think it was ill-informed, abrupt and not well-thought out. Q: What was your reaction to the U.S. recognizing Israeli sovereignty over the Golan Heights? A: That was [also] provocative, but the Golan Heights are part of Israel. Q: What’s your stance on American taxpayer funding for the Palestinian Authority? A: We should have funding. Just like Israel provides funding for humanitarian aid for the Palestinians, I think the United States should participate in that. We need to keep our eye on the ultimate goal of a two-state solution, and the peace between a Palestinian state and Israel. If we want that outcome, we need to set up everyone for success. If we have a Palestinian population that is suffering—that cannot build up its own infrastructure, its own education and its ability to function as a state—then we are sabotaging the agreement from the beginning. I think humanitarian aid, education aid and the ability to construct infrastructure is important, as does the State of Israel. They believe that is fundamental to their own national security. Q: Is there the concern that humanitarian funding for the P.A. could go towards rewarding terrorists and their families? Q: What was your reaction to the resolution condemning anti-Semitism and other forms of hatred, as well as critics who say it was watered down? A: I’m signing onto [Congressman] Brad Schneider’s resolution opposing the BDS movement. I wholeheartedly agree with the sentiment in that resolution: That it is inappropriate; it is unfairly targeting Israel. Q: What’s your reaction to the anti-BDS component of the Senate bill that would also strengthen the U.S. relationship with Israel and Jordan, in addition to enacting fresh sanctions against Syria? A: I didn’t have to consider the Senate bill. In terms of the BDS part, it was somewhat convoluted. But I am opposed to BDS because it unfairly targets Israel, and it singles Israel out for special pejorative treatment that no other country is subjected to. A: It’s horrifying. What we’re seeing is in the context of a general trend around the globe towards nationalism, white supremacism and anti-Semitism. It is always concerning. We’ve seen xenophobia and Islamophobia in this country. We ought to be concerned even when the hatred is not directed towards the Jewish people. We are the canary in the coal mine, and it always comes to us next, so that should inform our decisions about compassion for the stranger and our homeland. A: The only other thing I would add is that a lot of the reason I’m here in Congress is because I’m a Jewish woman, and that you grow up with an ethic of tikkun olam. That when something is wrong in the world, it is your job to make it a better place. I saw some really big wrongs in our country: taking health care away from people, xenophobia, Islamophobia, racism. I decided that if I didn’t roll up my sleeves to help get our country headed in a better direction, then I couldn’t expect anyone else to. Photo credit: Dr. Kim Schrier/Facebook.